A TINY frog that lives in the rainforests of North Queensland could provide humans with a cure for deadly bacterial diseases. Nuclear scientists are searching for ways to fight antibiotic-resistant bacteria such as golden staph, which kills thousands of hospital patients each year. They have found chemicals secreted from the skin of two amphibians, the Australian green-eyed tree frog and the growling grass frog, can form a defence to the bacteria. The cutting-edge research is being carried out at the Australian Nuclear Science and Technology Organisation's nuclear reactor at Lucas Heights in Sydney. Melbourne University Professor Frances Separovic, who is leading the project team, said they had characterised several small proteins - known as peptides - from the skin glands of the frogs, which had been found to host defence compounds with strong antibacterial activity. The peptides work by attacking the membranes of unwanted bacteria found on the frogs' skin, killing them before they can present a danger to the frog. unlock a cure for deadly bacterial diseases. "By understanding their 3D structure and mechanism of action at the molecular level, we may be able to increase their antibiotic potency or antimicrobial potency and specificity," Prof Separovic said. The nuclear reactor is being used to analyse, on a molecular level, how and why peptides from the frog skin secretions work, and how well they can kill bacterial cells. "Given that we don't want them to attack healthy human or frog cells, we also need to establish whether and how these antimicrobial peptides are selective for bacterial cells," Prof Separovic said. It is hope the research will be completed by the end of the year, providing a blueprint for scientists to develop new drugs that can combat antibiotic-resistant bacteria. 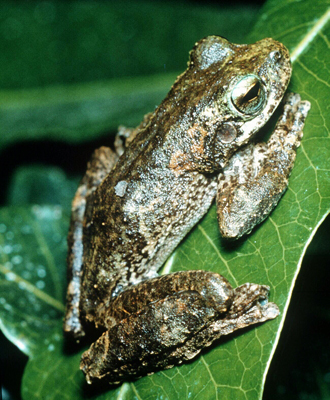 The two frog species have been selected for the project, as the skin secretions from the animals are known to protect the frogs against a broad range of bacteria. The green-eyed tree frog, also known as the tapping green-eyed frog, lives in rainforests in North Queensland, often found near rocky creeks. The species gets its name from the brilliant green colour over the brow of each eye. The frog grows to about 7cm long. It has adapted its appearance to blend in with the moss-covered forests, with most having a brownish-green body with rust-coloured blotches that match the lichen-covered rocks of the creeks and streams of its habitat.